Immersion in a world that is the background for a successful series of novels is often the penalty a writer pays. There is a demand for more novels from fans, there are also the requests from editors to contribute to anthology and the danger of coming out of the mindset needed for the next novel. The answer, as many writers have found, is to weave the short story around extant characters. 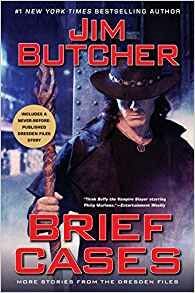 The fans of ‘The Dresden Files’, now up to book fifteen and a TV series, will be delighted to find this, a second collection of stories based in Dresden’s world. For those who don’t know Harry Dresden is a wizard, the only one in the telephone directory, working in Chicago. Nominally, he is a PI with a talent for finding things and people as the ordinary man in the street doesn’t believe in magic or the existence of mythical beings. Like most PIs, Dresden begins as a rogue not doing things the expected way. Over time, he has made friends, enemies and acquaintances of various denizens of the real and supernatural world. These stories fit between some of the novels. Jim Butcher has incorporated in the novels a hierarchy for the denizens of the supernatural world, including the powerful lords of Faerie. Creatures from worldwide folklore and myths have their place. The one he forgot was the Native American myth of Bigfoot. To remedy this he has written and, included here, three Bigfoot stories. In ‘B Is For Bigfoot’, the sasquatch River Shoulders is concerned about his son, Irwin, who is half-human is being bullied. Dresden is asked to look into the situation and help Irwin resolve it without having others think that he is sheltering behind adults. In ‘I Was A Teenage Bigfoot’, Irwin is boarding at an academy and has fallen ill. His father is concerned as anyone with Bigfoot heritage is immune to human illnesses. The problem here, as Dresden discovers, is that magic is involved. The third of this mini-series, ‘Bigfoot On Campus’, sees Irwin at college and falling in love. The problem is that the object of his affections is an adolescent White Court vampire. This sub-species feeds on human emotion. Theoretically, the first victims of such a girl vampire die. Irwin doesn’t but her father thinks he ought to. Although all the stories here are told in first person, a trademark of the novels, not all the stories here are told from Dresden’s perspective. One of the other Wardens, lawmen from the Council of Wizards, is Anastasia Luccio. She has already lived a long time when Dresden first meets her. ‘A Fistful Of Warlocks’ is from her youth when she is tracking down a rogue warlock in the Wild West. Most of the action takes place in Dodge City where Wyatt Earp is the deputy. Those who have read several books in the series will probably have come up against John Marcone. He is the local crime boss and, although he and Dresden are wary of each other, they have come to an accommodation. ‘Even Hand’ is told from Marcone’s perspective. He does have a sense of honour, especially where children are concerned and when Justine, the love of Dresden’s half-brother, Thomas, with a child rescued from the Fomor, he takes them under his protection and damn the consequences. Molly Carpenter is Dresden’s apprentice, her father being a friend of his. ‘Bombshells’ is one of the stories from her perspective. She, Justine and the werewolf, Andi, team up to infiltrate the party the Svartalfs are holding to celebrate a treaty with the Fomor. Trouble is, the Fomor are not to be trusted. Molly is also the narrator of ‘Cold Case’. By this time, her status has changed from being an apprentice wizard to something much more formidable. As a result, she is being sent to Alaska to collect an overdue tribute. It isn’t as easy or as straightforward as it seems at first. When we first met Waldo Butters, he was a human pathologist and almost a figure of fun. Over the series, he has developed into something much more and has accepted a role he wouldn’t initially have appeared suited for. ‘Day One’ is his initiation into that new role when a supernatural creature starts attacking children in hospital through their dreams. Three of the other stories, ‘AAAA Wizardry’, ‘Curses’ and ‘Jury Duty’ all show Dresden in some of his minor activities, such as training other wizards. ‘Zoo Day’ is rather different as it shows Dresden as a father, taking his daughter to the zoo. It is not straightforward for either of them. Fortunately, they have the able assistance of Mouse, a rather large, intelligent Temple Dog that adopted Dresden early in the series. The big problem of discussing the stories in a volume like this is that is difficult to do so without revealing spoilers. If this is the first book featuring Harry Dresden, readers will either be confused or inspired to seek out the novels. For those who have read some of the novels, it is a huge problem as the stories reveal roles and situations that they may not yet have met. The ideal situation would be to read the novels alongside this book, only reading the story after the novel that Butcher’s introductions indicate. Nevertheless, all the stories are excellent with unusual solutions. A good addition to the oeuvre.